According to widely-accepted theories, the Solar System formed roughly 4.6 billion years ago from a massive cloud of dust and gas (aka. Nebular Theory). 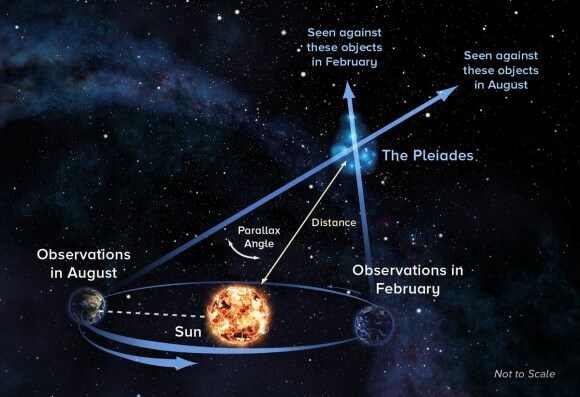 This process began when the nebula experienced a gravitational collapse in the center that became our Sun. The remaining dust and gas formed a protoplanetary disk that (over time) accreted to form the planets. However, scientists remain unsure about when organic molecules first appeared in our Solar System. 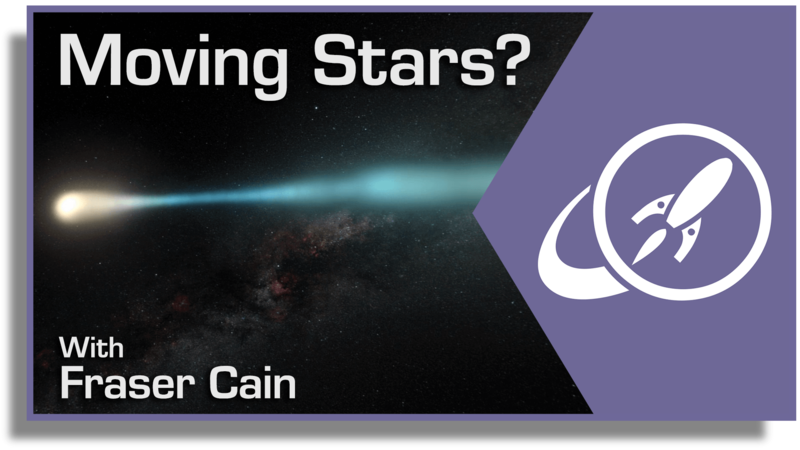 Luckily, a new study by an international team of astronomers may be able to help answer that question. Using the Atacama Large Millimeter-submillimeter Array (ALMA), the team detected complex organic molecules around the young star V883 Ori, which could someday lead to the emergence of life in that system. Relax, its not a space station! And according to the Chinese government, it’s for entirely peaceful purposes. 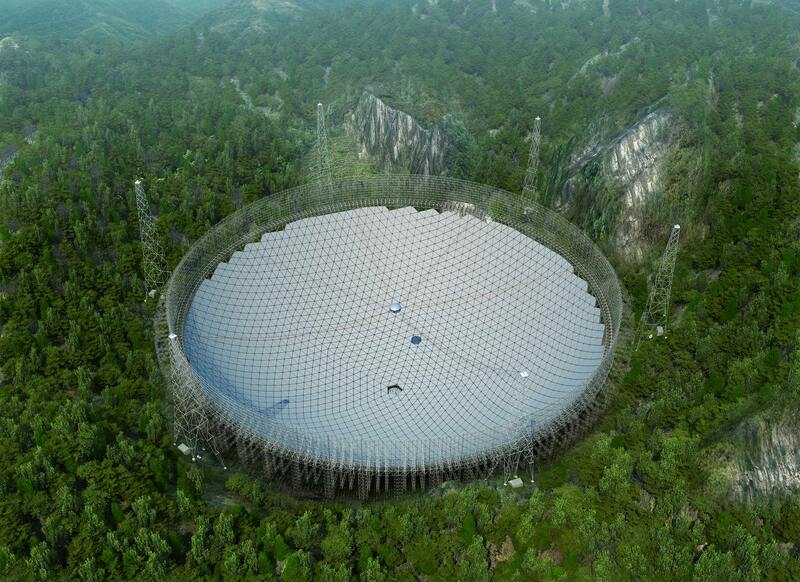 It’s known as the Five-hundred-meter Aperture Spherical Telescope (FAST), a massive array that just finished construction in the southerwestern province of Guizhou, China. Equivalent in size to over 20 football fields joined end to end, it is the world’s largest radio telescope – thus ending the Arecibo Observatory’s 53 year reign. As part of China’s growing commitment to space exploration, the FAST telescope will spend the coming decades exploring space and assisting in the hunt for extraterrestrial life. And once it commences operations this coming September, the Chinese expect it will remain the global leader in radio astronomy for the next ten or twenty years. In addition to being larger than the Arecibo Observatory (which measures 305 meters in diameter), the telescope is reportedly 10 times more sensitive than its closest competitor – the steerable 100-meter telescope near Bonn, Germany. What’s more, unlike Arecibo (which has a fixed spherical curvature), FAST is capable of forming a parabolic mirror. That will allow researchers a greater degree of flexibility. The Chinese Academy of Sciences (CAS) has spent the past five years building the telesccope, to the tune of 1.2-billion-yuan (180 million U.S. dollars). As the deputy head of the National Astronomical Observation, which is overseen by the CAS, Zheng Xiaonian was present at the celebrations marking the completion of the massive telescope. As he was paraphrased as saying by the Xinhua News Agency: “The project has the potential to search for more strange objects to better understand the origin of the universe and boost the global hunt for extraterrestrial life.” Zheng was also quoted as saying that he expects FAST to be the global leader in radio astronomy for the next 10 to 20 years. The construction of this array has also been a source of controversy. To protect the telescope from radio interference, Chinese authorities built FAST in Guizhou province’s isolated Dawodang depression, directly into the mountainside. However, to ensure that no magnetic disruptions are nearby, roughly 9,000 people are being removed from their homes and rehoused in the neighboring counties of Pingtang and Luodian. However, for others, FAST is merely the latest step in China’s effort to become a superpower in the all-important domain of space exploration and research. Their other ambitions include mounting a crewed mission to the Moon by 2036 and building a space station (for which work has already begun). In addition, FAST will enable China to take part in another major area of space research, which is the search for extra-terrestrial life. For decades, countries like the United States have leading this search through efforts like the SETI Institute and the Nexus for Exoplanet System Science (NExSS). But with the completion of this array, China now has the opportunity to make significant contributions in the hunt for alien intelligence. In the meantime, the CAS’ scientists will be debugging the telescope and conducting trials in preparation for its activation, come September. Once it is operational, it will assist in other areas of research as well, which will include conducting surveys of neutral hydrogen in the Milky Way and other galaxies, as well as detecting pulsars and gravitational waves. What are the Galilean Moons? It’s no accident that Jupiter shares its name with the king of the gods. In addition to being the largest planet in our Solar System – with two and a half times the mass of all the other planets combined – it is also home to some of the largest moons of any Solar planet. 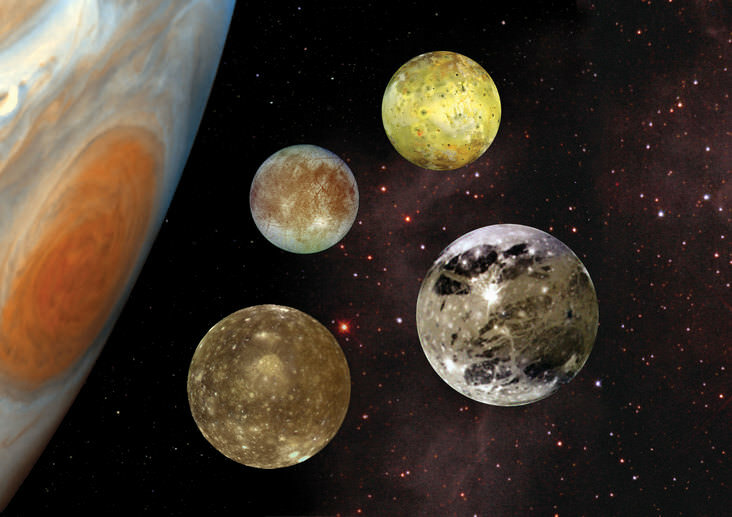 Jupiter’s largest moons are known as the Galileans, all of which were discovered by Galileo Galilei and named in his honor. They include Io, Europa, Ganymede, and Callisto, and are the Solar System’s fourth, sixth, first and third largest satellites, respectively. Together, they contain almost 99.999% of the total mass in orbit around Jupiter, and range from being 400,000 and 2,000,000 km from the planet. Outside of the Sun and eight planets, they are also among the most massive objects in the Solar System, with radii larger than any of the dwarf planets. How can astrobiologists find extraterrestrial life? In everyday life, we usually don’t have any problem telling that a dog or a rosebush is a living thing and a rock isn’t. In the climatic scene of the movie ‘Europa Report’ we can tell at a glance that the multi-tentacled creature discovered swimming in the ocean of Jupiter’s moon Europa is alive, complicated, and quite possibly intelligent. But unless something swims, walks, crawls, or slithers past the cameras of a watching spacecraft, astrobiologists face a much tougher job. They need to devise tests that will allow them to infer the presence of alien microbial life from spacecraft data. They need to be able to recognize fossil traces of past alien life. They need to be able to determine whether the atmospheres of distant planets circling other stars contain the tell-tale traces of unfamiliar forms of life. They need ways to infer the presence of life from knowledge of its properties. A definition of life would tell them what those properties are, and how to look for them. This is the first of a two part series exploring how our concept of life influences the search for extraterrestrial life. What is it that sets living things apart? For centuries, philosophers and scientists have sought an answer. The philosopher Aristotle (384-322 BC) devoted a great deal of effort to dissecting animals and studying living things. He supposed that they had distinctive special capacities that set them apart from things that aren’t alive. Inspired by the mechanical inventions of his times, the Renaissance philosopher Rene Descartes (1596-1650) believed that living things were like clockwork machines, their special capacities deriving from the way their parts were organized. In 1944, the physicist Erwin Schrödinger (1887-1961) wrote What is Life? In it, he proposed that the fundamental phenomena of life, including even how parents pass on their traits to their offspring, could be understood by studying the physics and chemistry of living things. Schrödinger’s book was an inspiration to the science of molecular biology. 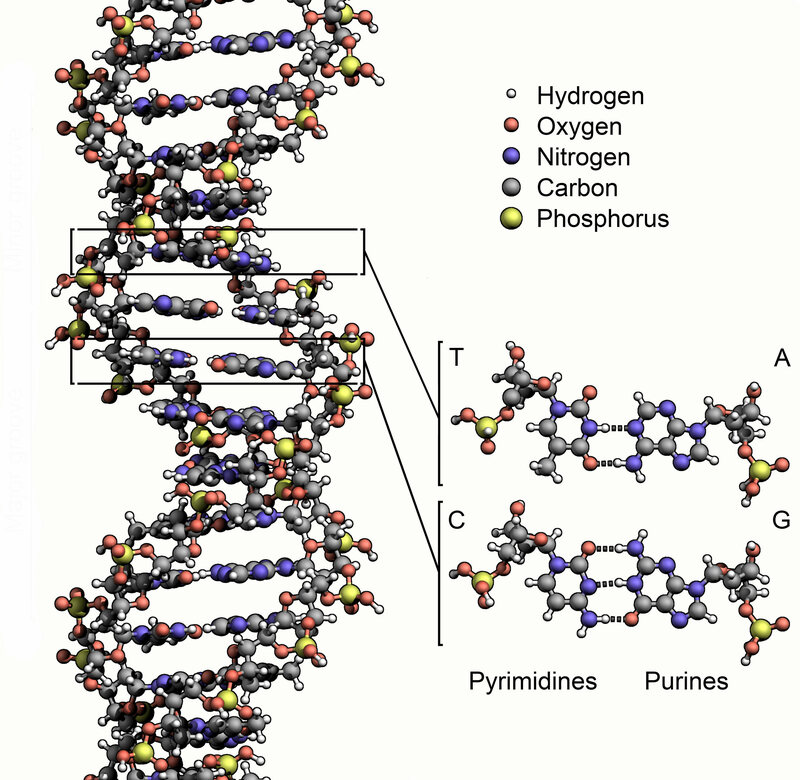 Living organisms are made of large complicated molecules with backbones of linked carbon atoms. Molecular biologists were able to explain many of the functions of life in terms of these organic molecules and the chemical reactions they undergo when dissolved in liquid water. In 1955 James Watson and Francis Crick discovered the structure of deoxyribonucleic acid (DNA) and showed how it could be the storehouse of hereditary information passed from parent to offspring. While all this research and theorizing has vastly increased our understanding of life, it hasn’t produced a satisfactory definition of life; a definition that would allow us to reliably distinguish things that are alive from things that aren’t. In 2012 the philosopher Edouard Mahery argued that coming up with a single definition of life was both impossible and pointless. Astrobiologists get by as best they can with definitions that are partial, and that have exceptions. Their search is conditioned by our knowledge of the specific features of life on Earth; the only life we currently know. Here on Earth, living things are distinctive in their chemical composition. Besides carbon, the elements hydrogen, nitrogen, oxygen, phosphorus, and sulfur are particularly important to the large organic molecules that make up terrestrial life. Water is a necessary solvent. Since we don’t know for sure what else might be possible, the search for extraterrestrial life typically assumes its chemical composition will be similar to that of life on Earth. Making use of that assumption, astrobiologists assign a high priority to the search for water on other celestial bodies. Spacecraft evidence has proven that Mars once had bodies of liquid water on its surface. 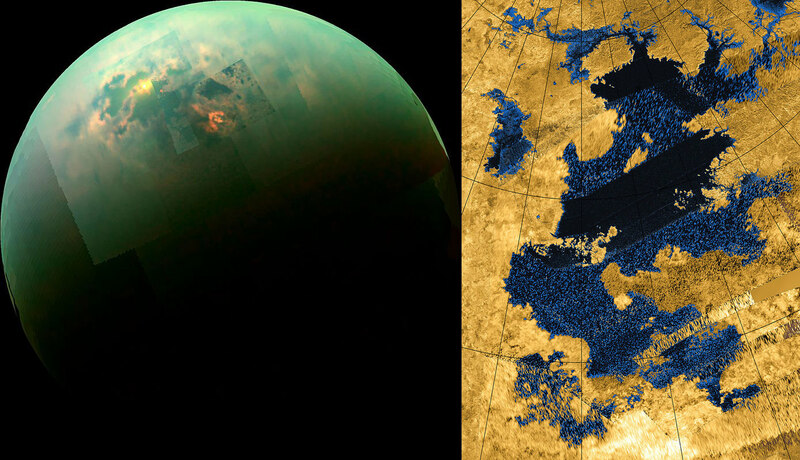 Determining the history and extent of this water is a central goal of Mars exploration. 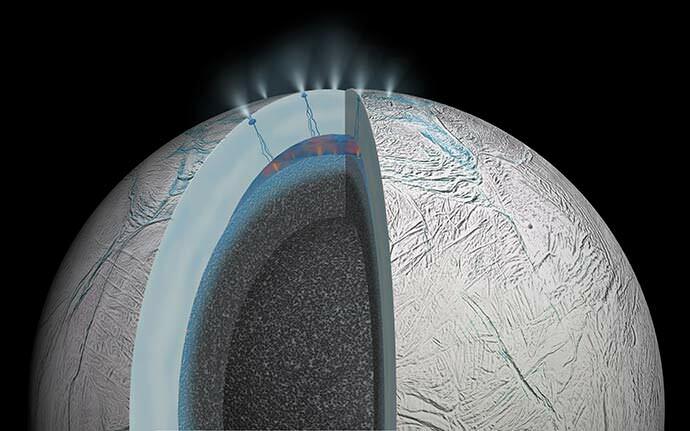 Astrobiologists are excited by evidence of subsurface oceans of water on Jupiter’s moon Europa, Saturn’s moon Enceladus, and perhaps on other moons or dwarf planets. But while the presence of liquid water implies conditions appropriate for Earth-like life, it doesn’t prove that such life exists or has ever existed. Jupiter’s icy moon Europa appears to host liquid water, an essential condition for life as we know it on Earth. Its surface is covered with a crust of water ice. The Voyager and Galileo spacecraft have provided evidence that under this icy crust, there is an ocean of saltwater, containing more liquid water than all the oceans of Earth. Europa’s interior is heated by gravitational tidal forces exerted by giant Jupiter. This heat energy may drive volcanism, hydrothermal vents, and the production of chemical energy sources that living things could make use of. Interaction between materials from Europa’s surface and the ocean environment beneath could make available carbon and other chemical elements essential for Earth-like life. Organic chemicals are necessary for Earth-like life, but, as for water, their presence doesn’t prove that life exists, because organic materials can also be formed by non-biological processes. In 1976, NASA’s two Viking landers were the first spacecraft to make fully successful landings on Mars. They carried an instrument; called the gas chromatograph-mass spectrometer, that tested the soil for organic molecules. Even without life, scientists expected to find some organic materials in the Martian soil. Organic materials formed by non-biological processes are found in carbonaceous meteorites, and some of these meteorites should have fallen on Mars. They were surprised to find nothing at all. At the time, the failure to find organic molecules was considered a major blow to the possibility of life on Mars. In 2008, NASA’s Phoenix lander discovered an explanation of why Viking didn’t detect organic molecules. If found that the Martian soil contains perchlorates. Containing oxygen and chlorine, perchlorates are oxidizing agents that can break down organic material. While perchlorates and organic molecules could coexist in Martian soil, scientists determined that heating the soil for the Viking analysis would have caused the perchlorates to destroy any organic material it contained. Martian soil might contain organic materials, after all. At a news briefing in December 2014, NASA announced that an instrument carried on board the Curiosity Mars rover had succeeded in detected simple organic molecules on Mars for the first time. Researchers believe it is possible that the molecules detected may be breakdown products of more complex organic molecules that were broken down by perchlorates during the process of analysis. In 1996 a team of scientists lead by Dr. David McKay of NASA’s Johnson Space Center announced possible evidence of life on Mars. The evidence came from their studies of a Martian meteorite found in Antarctica, called Alan Hills 84001. The researchers found chemical and physical traces of possible life including carbonate globules that resemble terrestrial nanobacteria (electron micrograph shown) and polycyclic aromatic hydrocarbons. In terrestrial rock, the chemical traces would be considered breakdown products of bacterial life. The findings became the subject of controversy as non-biological explanations for the findings were found. Today, they are no longer regarded as definitive evidence of Martian life. The chemical make-up of terrestrial life has also guided the search for traces of life in Martian meteorites. In 1996 a team of investigators lead by David McKay of the Johnson Space Center in Houston reported evidence that a Martian meteorite found at Alan Hills in Antarctica in 1984 contained chemical and physical evidence of past Martian life. There have since been similar claims about other Martian meteorites. But, non-biological explanations for many of the findings have been proposed, and the whole subject has remained embroiled in controversy. Meteorites have not so far yielded the kind of evidence needed to prove the existence of extraterrestrial life beyond reasonable doubt. 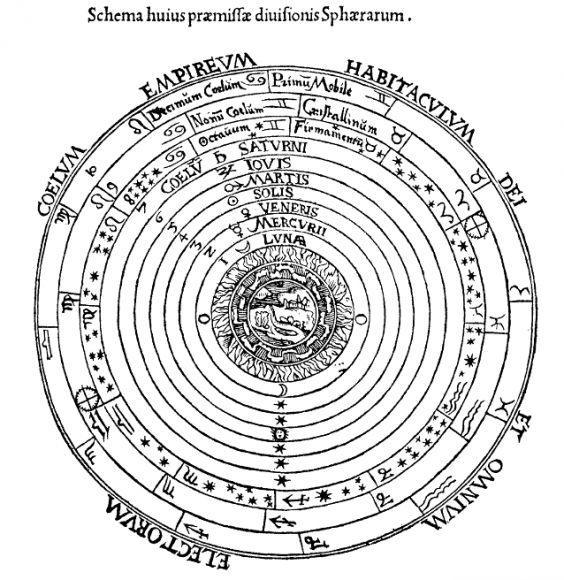 Following Aristotle, most scientists prefer to define life in terms of its capacities rather than its composition. In the second installment, we will explore how our understanding of life’s capacities has influenced the search for extraterrestrial life. N. Atkinson (2009) Perchlorates and Water Make for Potential Habitable Environment on Mars, Universe Today. Europa: Ingredients for Life?, National Aeronautics and Space Administration.